A version of this report will also be published on Co-Cure mailing list and Dx Revision Watch site. Note that information in this report applies to the revision of ICD-10 towards ICD-11. Countries using a "Clinical Modification" of ICD, for example, Canada (ICD-10-CA), the USA (implementing ICD-10-CM, in October 2013), Australia (ICD-10 AM) and Germany (ICD-10-GM) should refer to their own national modifications of ICD. The revision of ICD-10 is overseen by a Revision Steering Group (RSG) and is being undertaken by a number of Topic Advisory Groups (TAGs) via a collaborative authoring platform called the iCAT (Initial ICD-11 Collaborative Authoring Tool) using wiki like software. Topic Advisory Groups have responsibility for revision of the various chapters, formulating definitions and diagnostic criteria for the relevant categories and suggesting changes to the classification structure. Since 2007, anyone has been able to submit proposals to the various Topic Advisory Groups for changes or additions to ICD-10 via the ICD Update and Revision Platform. This is not the iCAT, but an extranet where any registered user has been able to submit proposals backed up with citations. The WHO has scheduled a press launch of the ICD-11 Alpha Draft and the iCAT electronic authoring platform between 10 - 17 May. Once launched, the iCAT will be viewable to anyone who registers for access. But there will be varying levels of editing authority which will initially be restricted to WHO Classification Experts, WHO Secretariat, ICD-11 Revision Steering Group, the Managing Editors and members of Topic Advisory Groups and working groups and the reviewers and expert advisers recruited by the TAG Managing Editors to assist with the reviewing of content. There is also an iCAT User Group for which anyone can register for membership. It is anticipated that the public will not be able to interact with the iCAT, for example to add comment on proposals, until after the Beta Draft has been released for public review and consultation. But following the launch, it should be possible to monitor the progress and population of content. I have requested clarification of whether the names of external reviewers recruited by TAG Managers will be identified within the iCAT and whether the public will be able to track reviewers' input and comments as content proposals progress through the Alpha Drafting Workflow. There are links for several key documents in Footnotes . The WHO publishes only ICD-10 Volume 1: The Tabular List and ICD-10 Volume 2: The Instruction Manual, online. Summaries of WHO meetings in 2007 and presentations in 2008 proposed that all three volumes of ICD-11 should be freely accessible via the internet. When ICD-11 is disseminated (2014+), all volumes, including Volume 3: The Alphabetical Index, will be electronically published and accessible online. In ICD-10 Volume 1: The Tabular List, "Postviral fatigue syndrome" is classified in Chapter VI (6) Diseases of the nervous system under G93 Other disorders of brain, coded G93.3. "Benign myalgic encephalomyeltis" is also coded G93.3. In ICD-10, "Chronic fatigue syndrome" is listed in Volume 3: The Alphabetical Index, only, where it is indexed to G93.3. To date, ICD Revision has been silent around the inclusion (or not) of "Chronic fatigue syndrome" in Volume 1: The Tabular List, in ICD-11. Nor has ICD Revision published any intention that it proposes to revise the existing Index code for "Chronic fatigue syndrome" for ICD-11 or that "Chronic fatigue syndrome" should be placed in a chapter other than Chapter VI (6), to which it is currently indexed, if it were the case that ICD Revision is considering the inclusion of "Chronic fatigue syndrome" in Volume 1: The Tabular List. ICD-11 will drop the use of Roman numerals for chapter numbering, so we shall be monitoring, for example, the development of Chapter 5: Mental and behavioural disorders (TAGMH) and Chapter 6: Diseases of the nervous system (TAG Neurology). The starting point for the Alpha Draft is the "Start-Up List" of categories that has been drafted by WHO to initiate the editing process. This list includes current ICD-10 content, input from ICD national modifications, primary care versions and speciality adaptations, textual definitions imported from affiliate classification publications, proposals received to revise the existing ICD via the Update and Revision Platform and other channels. During alpha drafting, detailed structured definitions will be added to these ICD categories according to a common template - the "Content Model". According to ICD Revision, the most important difference between ICD-10 and ICD-11 will be the "Content Model". The Content Model is designed to support detailed descriptions of the clinical characteristics of each category and clear relationships to other terminologies and classifications. It identifies the basic characteristics needed to define any ICD category through use of multiple parameters (eg Body Systems, Body Parts, Signs and Symptoms, Diagnostic Findings, Causal Agents, Mechanisms, Temporal Patterns, Severity, Functional Impact, Treatment interventions, Diagnostic Rules). So there is the potential for considerably more content to be included for diseases, disorders and syndromes for any given entity in ICD-11 than currently appears in ICD-10. "A Content Model for the ICD-11 Revision"
How advanced will the Alpha Draft be when it is launched? "Volume I of ICD-11 Alpha Draft will be published with full Morbidity Linearization ( like ICD-10 fourth edition ) including definitions for at least 80% of the categories. 20% of the entries should have content model parameters completed. "Volume II of ICD-11 Alpha Draft will be published as a prototype with guidelines and rules to the use of the classification for mortality and morbidity use cases. Revising ICD via the iCAT platform towards a publication comprising three integrable volumes capable of continuous revision in response to new scientific evidence is an ambitious and technically complex operation. ICD-11 is being authored collaboratively by Topic Advisory Group Managers, members and reviewers who are scattered all over the world and who are undertaking these roles in addition to their professional commitments. At present, 136 scientists from 36 countries and all WHO regions are contributing to the work. The Minutes of the April RSG meeting are not yet available and it's not clear how on target the Alpha Draft remains or whether the goals for May 2010 have had to be revised. *For a Glossary of Terms click on the ? next to the Field Titles which link to a general page setting out the terms and template for content population within ICD-11. There are no Definitions populated in this demo for the entry for "Postviral fatigue syndrome". Note that until the actual ICD-11 Alpha Draft is released, it cannot be determined how far the various Topic Advisory Groups have progressed with populating content according to the ICD Content Model for the categories of interest to us. Some "External definitions" have been entered into the demo. Note these have been imported from other classification systems, either as part of the initial "Start-up List", used to kick start the revision process, or are being used as examples of a populated field. Again, we need to wait until the draft comes out to see how many fields have been populated so far, their textual content, and the editing status of their content. type, pattern, or severity, and nonrestorative sleep. Risk Factors; Genomic Linkages; Etiology Type; Causal Mechanism; Functional Impact; SNOMED References not yet populated etc. Go back to the ICD Content Tab list and open the page for Chapter 5 (V) Mental and behavioural disorders. 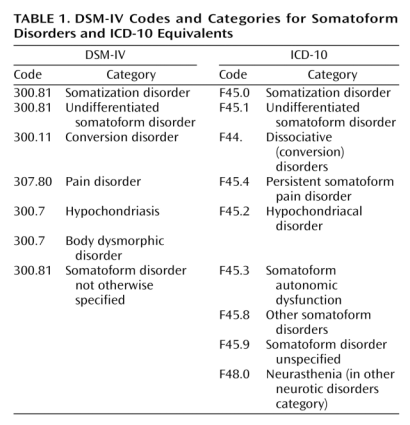 Then open "F45 Somatoform disorders"
where the existing categories in ICD-10 Chapter V: Somatoform disorders are listed. There is already a degree of correspondence between DSM-IV and Chapter V of ICD-10. For the next editions, the APA and the WHO have committed as far as possible: "To facilitate the achievement of the highest possible extent of uniformity and harmonization between ICD-11 mental and behavioural disorders and DSM-V disorders and their diagnostic criteria" with the objective that "The WHO and APA should make all attempts to ensure that in their core versions, the category names, glossary descriptions and criteria are identical for ICD and DSM." It should be evident from the iCAT demo that there is the potential for considerably more content to be included in ICD-11 than there is in ICD-10 and that the progress of the population of content for the categories of interest to us is going to need continuous monitoring as the Topic Advisory Groups and their reviewers work towards the Beta Draft. I shall update when further information on the launch of the alpha and iCAT becomes available over the next couple of weeks. Identifies the basic properties needed to define any ICD concept (unit, entity or category) through the use of multiple parameters. Describes the ICD revision process as an overall project plan in terms of goals, key streams of work, activities, products, and key participants. Sets out lines of responsibility between the various contributors for the alpha drafting phase. "The terms included in the category of the Tabular List are not exhaustive; they serve as examples of the content of the category or as indicators of its extent and limits. The Index, on the other hand, is intended to include most of the diagnostic terms currently in use. Nevertheless, reference should always be made back to the Tabular List and its notes, as well as the guidelines provided in Volume 2, to ensure that the code given by the Index fits with the information provided by a particular record. In indexing "Chronic fatigue syndrome" to G93.3, ICD-10 does not specify how it views the term in relation to "Postviral fatigue syndrome" or in relation to "Benign myalgic encephalomyelitis". Nor does ICD-10 specify how it views the relationship between "Postviral fatigue syndrome" and "Benign myalgic encephalomyelitis". An Alpha Draft for ICD-11 was expected to be released by May 2010. The Agenda of the April meeting of the ICD Revision Steering Group (RSG) also projected an ETA between 10 and 17 May. The Revision Steering Group (RSG) that is overseeing the revision of ICD-10 towards ICD-11 has yet to publish an update on the delay on the release of this early draft but I think we can assume that the timeline has slipped. The Alpha Draft is anticipated to be a partial draft. Diseases and disorders in ICD-11 are having considerably more content included, populated according to a common Content Model. For example, Definitions, Synonyms, Inclusions, Exclusions, Clinical Description, Diagnostic Criteria, Causal Mechanism and Risk Factors etc. The authoring of content by the various Topic Advisory Groups for all these fields for the thousands of diseases and disorders classified in ICD-11 is a considerable undertaking and ICD Revision has a great deal of work to plough through if the beta version is going to be ready by this time next year. The beta draft is scheduled for May 2011 and at that point, it is expected that the public will be able to comment on the beta version via the iCAT and possibly via other means. Until the WHO or the RSG issues a notice, I cannot provide you with any information on when we might now expect to see this early draft and as I say, when it is available, not all fields for all categories may be complete. As soon as I have some information, I will update here and on my websites. It isn't expected that there will be a public review process like the APA held between February and April for its own alpha draft for proposals for revised criteria for DSM-5. In September, last year, I was given to understand that a proposal form for use jointly in relation to ICD-11 Chapters 5 and 6 was in the process of being refined and would be available in the fall of 09 for the use of all stakeholders in the revision process. Evidently there was a change of plan and the Topic Advisory Groups (TAGs) have not published any public notice about the availabililty of a form. I have recently established, however, that some organisations, for example, the American Psychological Association (not to be confused with the American Psychiatric Association) appears to have submitted proposals via a joint form in relation to Chapter 5 F coded categories, unrelated to the focus of this site. So something else I need to establish is which stakeholders this form is being made available to, and when the Alpha Draft is released, whether there will be any process through which any stakeholder may submit comment on the alpha draft. The revision of ICD-10 towards ICD-11 will be of interest to the US, especially what textual content is included, but as you are probably aware, the US does not use ICD-10 and will not be moving on to ICD-11 post 2014+. The US uses what is called a "Clinical Modification" of ICD and will be moving onto a revised version of its current version, called ICD-10-CM, in October 2013. The current proposals for the classification and codings of Postviral fatigue syndrome, (Benign) mylagic encephalomyelitis and Chronic fatigue syndrome for the forthcoming ICD-10-CM differ from those in ICD-10 and are likely to differ from proposals for ICD-11. Earlier proposals for the forthcoming ICD-10-CM had all three terms classified in Chapter 6 at G93.3 (as is the case in the Canadian Clinical Modification, ICD-10-CA). As soon as I have any further information I will update this thread. entity or category) through the use of multiple parameters. goals, key streams of work, activities, products, and key participants. This post is intended to clarify any confusion between ICD-10, ICD-11 and the forthcoming US Clinical Modification, ICD-10-CM. The information in this report relates to proposals for ICD-11. It does not apply to ICD-10-CM, the forthcoming US "Clinical Modification" of ICD-10. Whither the ICD-11 Alpha Draft? According to documents published by the ICD Revision Steering Group (RSG) and the Agenda for the iCAMP2 and Revision Steering Group meeting on 19-23 April 2010, it was projected that an alpha draft for ICD-11 would be ready by 10 May 2010 [Key document 1a]. The RSG meeting Agenda proposed that the alpha draft should be presented to the World Health Assembly (WHA) between 17-25 May. A proposal for a press launch was also tabled for discussion. It is understood that the ICD-11 alpha draft is being created for internal users, was not expected to be complete by May 2010, but released as a "work in progress" towards the beta stage. The beta draft for ICD-11 is scheduled for 2011, which will be subjected to systematic field trials and then made available for public comment. 10 May has come and gone, and there has been no public launch of an alpha draft or the iCAT - the wiki-like collaborative authoring platform through which ICD-11 is being drafted. When the RSG does release information on the status of the alpha draft and the operational status of the iCAT, I will post an update. In the meantime, I have raised a number of queries around the status of the alpha draft, whether the RSG intends to make a draft available for public viewing, at what point, and in what format(s). I have also asked for information about the availability of Topic Advisory Group proposal forms for stakeholder input, up to what stage in the development process timeline these might be used, and which stakeholders are going to be permitted to make use of proposal forms. In the posting ICD-11 Alpha Draft scheduled to launch between 10 and 17 May, 6 May, I reported that it is already possible to view a "Demo and Training iCAT Platform" and also access the iCAT production server. I cautioned that until an official ICD-11 Alpha Draft is released, it cannot be determined how far the various Topic Advisory Groups have progressed with revising classifications and populating textual content according to a common "Content Model" for the ICD Chapters and categories of interest to us [Key document 1b]. I noted that the Demo and Training iCAT Platform, at that point, was sparsely populated for content and that the classifications and codings listed within the various chapters appeared to have been imported from ICD-10, with little discernable change - presumably as the starting point for the drafting process. A revised Demo and Training iCAT Platform is now accessible, the content of which is also viewable on the iCAT production server and it is to these proposed revisions that I want to draw your attention. Note that anyone can view the Demo and Training iCAT Platform and iCAT production server but only WHO, ICD Revision and IT personnel and the Managers and members of the various Topic Advisory Groups (TAGS)will have editorial access. External reviewers recruited by TAG Managers will also use the iCAT to upload reviews and comment on proposals and content. I have compiled a series of screenshots and very brief notes on what is viewable at the moment for the chapters and categories of interest to us. Note: Screenshots are taken from the Demo and Training iCAT Platform and iCAT production server as they stood at 24 May 2010. Alpha drafting is an ongoing process and what currently appears may be subject to revision, refinement and additions before an official Alpha Draft is released. Not all the classification and content work currently undertaken may have been entered into the iCAT. When you have read this report and familiarised yourself with the way the iCAT functions, I suggest you poke around you cant break anything as members of the public have no editing access. A wiki-like Collaborative Authoring Tool (known as the iCAT)) is being used for the initial authoring of the alpha draft. Load either (they may take a minute or more to load and appear less inclined to hang in Firefox). Welcome to iCAT the Initial ICD 11 Collaborative Authoring Tool! Select the ICD Content Tab and ICD Categories by chapter will populate down the left side of the screen. Scroll down and note that ICD-10 codings between G83.9 and G99.8 are being reorganised and have been assigned the labels GA thru GN (some of which, like GN, are parent categories with child and grandchildren categories). Click on the double speech bubble icon next to Gj92 Chronic fatigue syndrome which will display 1 Category Discussion Note (Click Expand to display the full note. Discussion Notes can also be accessed via the Category Notes and Discussions Tab, from which the screenshot below, orginates). This Discussion Note records a Change in hierarchy for class: G93.3 Postviral fatigue syndrome because its parent category (G93 Other disorders of brain) is removed. Note that the removal of the parent G93 Other disorders of brain will affect other categories also classified under G93 in ICD-10, not just G93.3. Open up the double speech bubble icons next to other category listings and you can view the Discussion Notes on proposed restructuring for other G8x and G9x categories. Next, with the ICD Content Tab selected, click on Gj92 Chronic fatigue syndrome and the Details for Gj92 Chronic fatigue syndrome will display on the right side of the screen. Allow a few moments for the text in the boxes to load. To view a Glossary of Terms page, which defines the terms in the Tabs click on the blue question mark icons which will load the iCAT Glossary. [See Glossary: Definition] The full text of External Definitions (imported from affiliate classification publications) which is partly hidden in the screenshot, is appended at end of this post. According to discussion on the iCAT Users Google Group, it is proposed that External Definitions might be given less prominence when displaying in the iCAT. Now click on the Terms Tab. Benign myalagic encephalomyelitis currently appears listed as an Inclusion to Gj92 Chronic fatigue syndrome. Very few of the other Content Tabs have been populated but it is envisaged that they will be in due course. Short definition: Inclusion terms are either synonyms of the category titles or subclasses which are not represented in the classification hierarchy. Details: Inclusion terms appear in the tabular list of the traditional print version and show users that entities are included in the relevant concept. All of the ICD-10 inclusion terms have been imported and accessible in the iCat. These are either synonyms of the category titles or subclasses which are not represented in the classification hierarchy. Since we have synonyms as a separate entity in our ICD-11 content model, the new synonyms suggested by the users should go into the synonyms section. In the future, iCat will provide a mechanism to identify whether an inclusion is a synonym or a subclass. Short definition: Exclusion terms help users eliminate entities that should be assigned to a different ICD category because of differences in meaning or terminology. I am including some screenshots of other Chapters which will be of interest. A syndrome of unknown etiology. Chronic fatigue syndrome (CFS) is a clinical diagnosis characterized by an unexplained persistent or relapsing chronic fatigue that is of at least six months duration, is not the result of ongoing exertion, is not substantially alleviated by rest, and results in substantial reduction of previous levels of occupational, educational, social or personal activities. Common concurrent symptoms of at least six months duration include impairment of memory or concentration, diffuse pain, sore throat, tender lymph nodes,headaches of a new type, pattern, or severity, and nonrestorative sleep. The etiology of CFS may be viral or immunologic. Neurasthenia and fibromyalgia may represent related disorders. Also known as myalgic encephalomyeltis. distinctive syndrome characterized by chronic fatigue, mild fever, lymphadenopathy, headache, myalgia, arthralgia, depression, and memory loss: candidate eitiological agents include Epstein-Barr and other herpesviruses. A syndrome characterized by persistent or recurrent fatigue, diffuse musculoskeletal pain, sleep disturbances, and subjective cognitive impairment of 6 months duration or longer. Symptoms are not caused by ongoing exertion; are not relieved by rest; and result in a substantial reduction of previous levels of occupational, educational, social or personal activities. Minor alterations of immune, neuroendocrine, and automatic function may be associated with this syndrome. There is also considerable overlap between this condition and FIBROMYALGIA. but that in the absence of further information, it is currently unclear what the proposed hierarchical status of Postviral fatigue syndrome and Benign myalgic encephalomyelitis will be in relation to Chronic fatigue syndrome, and in relation to each other. I shall continue to monitor the iCAT production server closely and report on any changes to proposals for Category listings and on the progress of the population of content. I will need to read this again at some point, so could you tell me what your overall impression of this is, or is it to early to say anything? Thanks for all this suzy. To me, this is looking okay so far. I've only had a glance, and like V99 would be interested to hear what you think. Firstly, it's essential that the brief ICD Glossary of Terms page is read, especially the Glossary entries for ICD Title, Synonyms, Inclusions and Exclusions. Secondly, it needs to be understood that the alpha draft is a "work in progress" and that not all content will have been compiled yet, or if compiled, not yet entered into the iCAT. It was not anticipated that by May 2010, all proposed content for all categories for all Chapters would have been populated in the iCAT; previous versions of ICD have not contained this amount of textual content, before, and much of it will need generating. I have been waiting for information on whether a draft is going to be released, at this stage, in addition to what can be seen in the iCAT. I received confirmation this morning, from a secondary source, that a print copy of the draft was presented by the WHO at the World Health Assembly meeting between 17 and 25 May. It's unconfirmed, but it does not look as though there is going to be any press launch at this stage. It's also unconfirmed whether any form of alpha draft other than the iCAT will be made publicly available further on in the production timeline but before the beta drafting stage is reached. I don't consider there is sufficient information at the moment, to gain a clear picture of current proposals. As I've noted in my report, the removal of the G93 category parent "Other disorders of brain" affects a number of old ICD-10 classifications. And as you see, the section of ICD-10 G83.9 to G99.8 is being restructured. But the Discussion Note against Gj92 Chronic fatigue syndrome is not that clear. It notes a hierarchy change because the parent class G93 Other disorders of brain is being removed so the G93 parent loses child G93.3 Postviral fatigue syndrome but it doesn't set out what then happens with the ICD-10 legacy term "Postviral fatigue syndrome". "Postviral fatigue syndrome" had been the Category Term in ICD-10 under which Benign ME had sat (though the relationship was not specified) and to which Chronic fatigue syndrome had been indexed. that Postviral fatigue syndrome and Benign ME are accounted for in a print version (but not the iCAT) but that the Details (Definition and all other Terms) will default to the Details for Gj92 Chronic fatigue syndrome. (Note there are references to ME in the imported External Definitions). Which is why I stress that the projected relationship between the three isn't possible to determine from the information we currently have. Until this is clear and until we have more fields populated then I defer commenting on the Definition as it currently stands, in case there is also to be a "stand alone" Details page for Benign ME. It's not known what eventual codes either of the three terms will be allocated at this stage. After all these years, and given the literature and all the material on websites, it would seem odd to have one or more of these familiar terms allocated a new code. But if the parent class G93 is being removed, then there is the potential for many categories to have a new code allocated. ICD-11 isn't scheduled for completion until 2014/5. The Chair of the Topic Advisory Group is based at Imperial College London. I may approach the Chair for a clarification of proposals as they currently stand. Endorsement of Alpha-draft ICD-11 by WHO. WHO will consider endorsement of the alpha draft, after all concerns of RSG and the Classification TAGs have been duly taken into account. The alpha draft is a frozen state of development of the ICD-11 that will include a large part of the structural changes, and the majority of the definitions. The Alpha draft will be produced in a traditional print and electronic format. The Alpha Draft will also include a Volume 2 containing the traditional sections and including a section about the new features of ICD-11 in line with the style guide. An index for print will be available in format of sample pages. A fully searchable electronic index using some of the ontological features will demonstrate the power of the new ICD. The tattoo thing was bothering me, good job I only got the WHO ICD bit. Thanks ME agenda, your hard work is very much appreciated. You completely blow me away with you knowledge and fight. Thanks for the summary Suzy. This information does not apply to ICD-10-CM, the forthcoming Clinical Modification of ICD-10, which is scheduled for implementation in October 2013 and is specific to the US. Post #45 is intended to clarify any confusion between ICD-10, ICD-11 and the forthcoming US specific Clinical Modification, ICD-10-CM. On 7 June, in Post #46, I published a report that includes 13 screenshots from the iCAT, the wiki-like Web 2.0 collaborative authoring platform through which ICD-11 is being drafted. Note that what currently appears in the iCAT and in my June report may be subject to revision by the ICD Revision Steering Group and Topic Advisory Groups prior to an alpha draft being publicly released or presented at the forthcoming September iCamp2 meeting. where the public can access minutes of iCamp and Topic Advisory Group (TAG) meetings, meeting agendas, key documents and presentations. which projects a Beta Draft release for May 2012. No ICD-11 Alpha Draft was publicly released in May. But a hard copy snapshot of the alpha, as it stood at that point, was presented by the WHO at the 63rd World Health Assembly meeting, between 17 and 25 May. An ICD Revision iCamp2 meeting had been scheduled for April but was postponed. The meeting has been rescheduled for later this month. iCamp2 is now scheduled for 27 September 1 October 2010, in Geneva. Following iCamp meetings, PowerPoint presentations are sometimes made publicly available on the website. According to sources, the print version of the alpha draft is now expected to be made available around the time that the iCamp2 meeting takes place, later this month. A draft print version will be available in September 2010. ICD Revision has clarified that a draft print version will be available in September 2010. Clarification would also be welcomed on whether this Alpha Draft will be available for internal use only or intended for public viewing, and if for public viewing, in what format(s)? The Alpha draft will be produced in a traditional print and electronic format. The Alpha Draft will also include a Volume 2 containing the traditional sections and including a section about the new features of ICD-11 in line with the style guide . An index for print will be available in format of sample pages. A fully searchable electronic index using some of the ontological features will demonstrate the power of the new ICD. Since 2007, it has been possible for stakeholders in the development of ICD-11 to submit proposals and comments, supported by citations, via the ICD Update and Revision Platform Intranet. It was understood last year, that for some Topic Advisory Groups a proposal form for ICD-11 was being prepared for use by stakeholders. Information about the availability of proposal forms for the various Topic Advisory Groups, up to what stage in the development process timeline these might be used, and which stakeholders would be permitted to make use of proposal forms would be welcomed. It remains unclear what will be ready by September, whether it will be available for public scrutiny, and in what format(s), and by what various means stakeholders might submit proposals prior to and following the release of an Alpha Draft. This request for clarification has yet to receive a response. On my Dx Revision Watch website, at Post #46, is a report I published on 7 June that includes screenshots from the iCAT, the wiki-like collaborative authoring platform through which ICD-11 is being drafted. For better understanding, it is important that the brief iCAT Glossary page is read in conjunction with the iCAT screenshots, especially the Glossary entries for ICD-10 Code; ICD Title; Definition; Terms: Synonyms, Inclusions and Exclusions . Secondly, it needs to be understood that the alpha draft is a work in progress. Not all content will have been compiled yet and entered into the iCAT and there are many blank fields awaiting population for all chapters and for all categories. It also needs to be understood that some text already entered into the various Details fields may still be in the process of internal review and subject to revision. Because Topic Advisory Groups are still in the process of entering content into the iCAT not all listings and content that is intended to be included in the print version of the alpha draft may be visible to us, at this point, in the iCAT drafting platform. One of the biggest changes between ICD-10 and ICD-11 is that in ICD-11, Categories will be defined through the use of multiple parameters. In ICD-10, there is no textual content for the three terms Postviral fatigue syndrome, Benign myalgic encephalomyelitis and Chronic fatigue syndrome. There are no definitions and the relationship between the three terms is not specified. But in ICD-11, categories will be defined through the use of multiple parameters: Title & Definition, Terms: Synonyms, Inclusions, Exclusions, Clinical Description, Signs and Symptoms, Diagnostic Criteria and so on, according to a common Content Model  and as evidenced by the screenshots. So have a look at Post #46 if you have not already done so. Or have a poke around in the iCAT wiki production server. The public has no editing rights so you cant break anything . On 28 June, I contacted Dr Raad Shakir who chairs the ICD Revision Topic Advisory Group for Neurology, for clarifications in respect of current proposals for ICD-11 Chapter 6 (VI). My understanding is that what is being proposed at this point for ICD-11 is that ICD categories coded between G83.9 thru G99.8 in ICD-10 Chapter VI: Diseases of the nervous system, are being reorganised. That GN Other disorders of the nervous system is parent to five child classes that are assigned the Sorting labels Gj90-Gj94. That Gj92 Chronic fatigue syndrome displays no child classes of its own. Gj92 Chronic fatigue syndrome displays as a ICD Title term. It has an External Definitions field populated which includes definitions imported from other classification systems, the text of which includes Also known as myalgic encephalomyelitis. It has Benign myalgic encephalomyelitis specified under Inclusions. It has no Synonyms, Exclusions or other descriptor fields populated yet. Inclusion terms appear in the tabular list of the traditional print version and show users that entities are included in the relevant concept. All of the ICD-10 inclusion terms have been imported and accessible in the iCat. These are either synonyms of the category titles or subclasses which are not represented in the classification hierarchy. Since we have synonyms as a separate entity in our ICD-11 content model, the new synonyms suggested by the users should go into the synonyms section. In the future, iCat will provide a mechanism to identify whether an inclusion is a synonym or a subclass. 1] In ICD-10 Volume 3: The Alphabetical Index, Chronic fatigue syndrome is indexed to G93.3 but does not appear in the Tabular List. In ICD-11, is it being proposed that Chronic fatigue syndrome will be included in the Tabular List in Chapter 6 (VI) Diseases of the nervous system under (GN) Other disorders of the nervous system? 2] In ICD-11, is it being proposed that rather than Postviral fatigue syndrome being the ICD Category Title term (previously coded at G93.3, but which has now lost its parent class, G93) that Gj92 Chronic fatigue syndrome is proposed as a new ICD Category Title term? If this is the case, what is the current proposed relationship between the terms Postviral fatigue syndrome and Gj92 Chronic fatigue syndrome ? That is, is it proposed that in the tabular list, Postviral fatigue syndrome would still appear as a discrete Category Title term or is it intended that it should be subsumed under Gj92 Chronic fatigue syndrome or become a Subclass of, or Synonym to Chronic fatigue syndrome, or to have some other relationship? 3] In the iCAT, the term Benign myalgic encephalomyelitis (previously coded at G93.3, but which has now lost its parent class G93) is listed as an Inclusion under Details for Gj92 Chronic fatigue syndrome but does not appear listed under GN Other disorders of the nervous system in the ICD Category List with a Sorting label of its own, nor as a child to Gj92 Chronic fatigue syndrome. What is currently being proposed for ICD-11 for the classification and coding of Benign myalgic encephalomyelitis, as an entity, and its relationship to Chronic fatigue syndrome? Since this is not explicit from the information as it currently displays in the iCAT, nor from the Discussion Note to Gj92, I should be pleased if you could disambiguate current proposals for the classification of, and relationships between these three terms for ICD-11. I will update when a response has been received and when further information about a print version of the alpha draft becomes available. Other than making general enquiries around the development of ICD-11 and the operation of the iCAT and this request for clarification of current proposals, I have made no representations to any ICD Topic Advisory Group, nor submitted any proposals through any means nor have I had any discussions with WHO personnel or Topic Advisory Group members in relation to current or future proposals for the three terms of interest to us. Benign myalagic encephalomyelitis currently appears listed under Inclusions to Gj92 Chronic fatigue syndrome. Note that Postviral fatigue syndrome is not listed under Inclusions and that Synonyms and Exclusions for Gj92 Chronic fatigue syndrome have yet to be populated. [See Glossary: Synonyms, Inclusions, Exclusions]. Very few of the other Content Tabs have been populated but it is envisaged that they will be in due course. but that in the absence of a clarification from the TAG Neurology Chair and sight of the Alpha Draft it is currently unclear what the proposed hierarchical status of Postviral fatigue syndrome and Benign myalgic encephalomyelitis will be in relation to Chronic fatigue syndrome, and in relation to each other. Patient Classification Systems International: 2010 Case Mix Conference, Munich, Germany. 15-18 September 2010. 2010 Rodrigues; licensee BioMed Central Ltd.
ICD is the international de facto standard classification for most epidemiological and many health-care and clinical uses. Originally designed to record causes of death, the usage of ICD has been extended to include morbidity classification, reimbursement, and several other specialty areas such as oncology and primary care. The current 10th edition of ICD was endorsed by the World Health Assembly in 1990and has been periodically updated over the years. Recently, the World Health Assembly decided to develop a completely new version named the 11th revision. In previous revisions of ICD, specialty experts and national representatives of WHO collaborative classification centers proposed additions and changes to the codes (using lists of codes for creating new drafts). In contrast, the development of ICD-11 aims to create an information infrastructure and workflow processes that utilize knowledge engineering and management techniques that are supported by software. Instead of just codes, titles, and associated rules and indices, the information infrastructure will enable a more detailed definition of disease and health conditions, as well as the use of reference terminologies and ontologies, review of best scientific evidence, and field trials of draft standards. In terms of workflow, the information infrastructure should support the collaborative development of new content and proposed changes, rigorous review and approval processes, and the creation of draft classifications for field testing. The ICD revision process was initially the work of Topic Advisory Groups (TAG) that had been set up for various specialty areas. The ICD-11 revision process will eventually be opened up for comments and suggestions from interested parties on the Internet. The web platform named ICAT has been developed by a team of Stanford University to allow a collaborative population of the content model by their different tags. The ICD-11 content model is still evolving, but the main components have been specified. A detailed guide describes the expected content and usage of each component. It is the document that records the shared understanding of the content model. The OWL content model realizes the informal description in the guide and formalizes the three-layer conceptualization of the original UML model. The ICD-11 content model is very much a work in progress. Consensus formulation of several components such as temporal properties, severity properties, and diagnostic criteria is not yet available. From the view point of case mix, the new tools will provide an ICD of better quality for morbidity, thus allowing better mapping between diagnosis systems and, as a result of this, better mapping across case-mix systems based on diagnosis coding. For some time now, I have been trying to establish whether ICD Revision intends to release any form of ICD-11 Alpha Draft for public scrutiny. An Alpha Draft had originally been scheduled for May 2010. At that point, it was in fact the case that both the iCAT authoring platform server and the iCAT demo and training platform had been viewable by the public, although only WHO, ICD Revision Steering Group, ICD Revision IT technicians and Topic Advisory Groups (TAGs) had editing access. In early November, access to viewing the iCAT and the iCAT demo platform was closed to the public. Topic Advisory Group (TAG) members now require a password login for both browsing and editing the iCAT or importing data and the public can no longer view the iCAT and the population of ICD Title Categories and Content, at all. Before the iCAT was taken out of the public domain, I had taken a series of screenshots of what could be seen in the iCAT for Chapter 5 and Chapter 6 which I shall be posting on DSM-5 and ICD-11 site shortly.